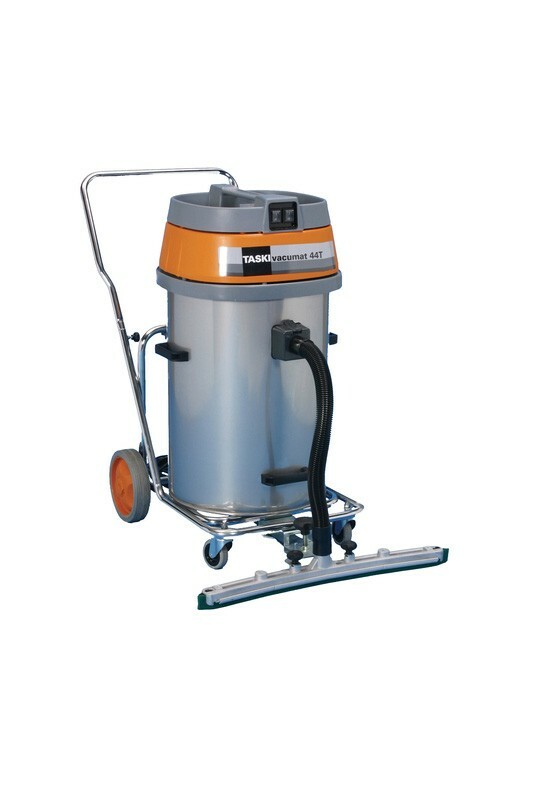 The JohnsonDiversey Taski Vacumat 44T is a large corded wet/ dry vacuum cleaner featuring a Fixomat squeegee for efficient water pickup and streak free drying results. Ideal for use in medium-to-large sized areas. The machine can be clean up to three times faster compared to conventional wet/dry vacuuming methods. Used together with a Taski Ergodisc machine for basic cleaning tasks such as stripping or wet scrubbing can lead to significantly increased productivity. Results include total cost efficiency and convenience for the operator. The Fixomat squeegee ensures efficient water pick up and yields streak-free, excellent drying results. 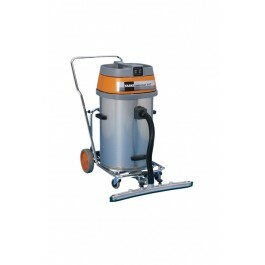 For cleaning of spillages, small areas or any other customer specific need, the machine can be equipped with a variety of accessories for wet cleaning. The machine's adjustable handle ensures comfort and ergonomics during operation. Its tilt system and comfortable handle grip on the container makes emptying of the container ergonomic and easy. A specially designed mechanical float system with a dual filter guarantees double protection of the motor unit and significantly prolongs service life. Resistant to alkaline and acidic cleaning solutions, the stainless steel tank combined with the robust steel trolley with rubber wheels ensures high durability.